Starting to think about the holidays? With the nature of this business, we are always thinking at least one season ahead. We don’t believe in pushing seasons or holidays on our customers, but we’d like to share this special crop with you! This is our 3rd year growing our own poinsettias. We bring our poinsettias in during the last week of September, and grow them on into the holiday season. This is a very demanding crop, originating from South America, the poinsettia crop is more acclimated to warmer climates and brighter days. When we receive our poinsettias, they are green. But as the daylight diminishes and the temperatures drop, the colors that we all expect around the holidays start to enhance. 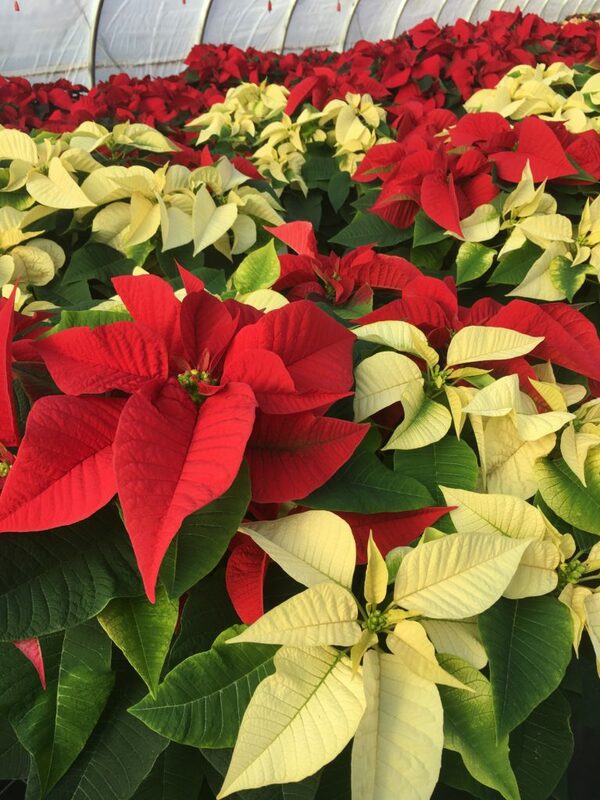 One of our deciding factors to grow poinsettias is that we are able to order more colors and sizes that are otherwise unavailable. We have some favorites that you cannot find anywhere else in this area! Two that come to mind are Ice Punch, a vibrant reddish-pink with white down the middle, and Burning Embers which takes on an glowing orange hue. Check out our gallery to see the progress of our poinsettias! This entry was posted in What's New? and tagged holidays, poinsettias.